Our work, together with quality materials, has allowed us to operate in every sector where insulation, energy saving, hygiene and flexibility are fundamental elements of value for our Customers. The know-how developed over the years, the applied technologies, the process automation make the FRIGOR-BOX solutions the right answer to your needs in the information technology era. 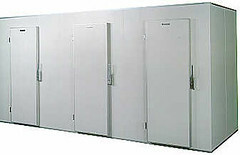 2 types of commercial coldrooms are available. FLOOR: the standard floor is reinforced to stand a max. load of 200 Kg. on 4 large section rubber wheels. For heavier hand trucks and trolleys, or transit of forklifts, special reinforcements are supplied, with a price surcharge. Therefore it is required, upon order confirmation, to specify the means used for loading and unloading the coldroom. In case water-tightness is required (meat, fish, dairy products), we recommend the sealing of the panel joints of a fibreglass floor by means of resin and glass fibre. N.B. the floor where the coldroom will be installed must be levelled. ALL STANDARD FLOOR PANELS ARE MADE WITH UPPER CLADDING IN ANTISLIP FOODSAFE FIBREGLASS. CEILING: it is self-supporting to certain maximum spans (ask our sales department). The ceiling can stand the weight of 2 people with relevant toolbox, for the usual maintenance operations. It is NOT suitable to stand any static load. For longer spans special supporting devices are supplied. PARTITION WALLS: they are fixed by aluminium corner sections + rounded PVC profile (APR). 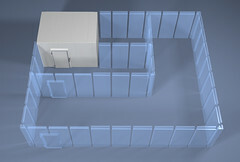 To calculate the area of partition walls, the outside dimensions of the coldroom relevant to the position of the partition wall should be used. 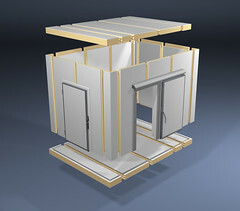 COLDROOMS FOR OUTSIDE INSTALLATION: the coldrooms installed outside can be mounted only if a suitable roofing structure is supplied, and the walls exposed to the sun should be cladded by a reinforced fibreglass (with price surcharge). N. B.: PVC-coated galvanized steel is not suitable for outside installation. ASSEMBLY: FRIGOR BOX has designed a specially easy assembly method of coldroom panels, which allows even not particularly skilled personnel the assembly of the coldroom in a very short time and without any special equipment. In short, the assembly is carried out from the coldroom inside, by cam locks, which allows the maximum use of space compatibly with the standard dimensions as per catalogue. FRIGOR BOX carry out the assembly at the price agreed each time according to distance and dimensions of the coldroom. The series KS has been designed to increase the range of mini-coldrooms and nowadays it represents the TOP of European production. The constructional system allows the installation of fully radiused floor joints on large areas, and ensures a perfect insulation. In fact the outside panel cladding goes from floor to ceiling, with no interruptions of the coldroom wall. This system guarantees a better insulation and an easier assembly even in situations where the floor is not perfectly levelled. The panel joint is tongue-and-groove type with cam locks. This creates a "bayonet" joint which prevents the formation of uncontrolled empty spaces and thermal bridges, thus always guaranteeing energy saving.